Warning: If you’re scared of heights, tread lightly—just looking at the pictures in this gallery will make your stomach drop! 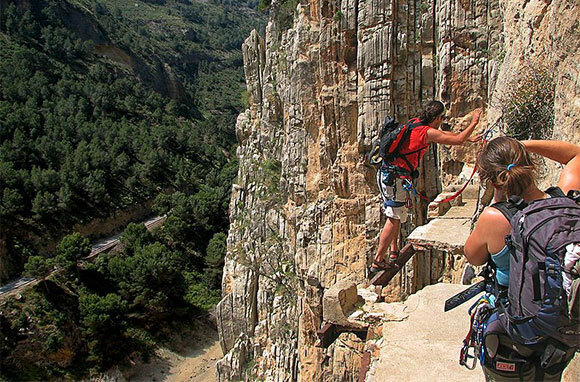 Read on if you think you can handle these 10 scary cliff walks. 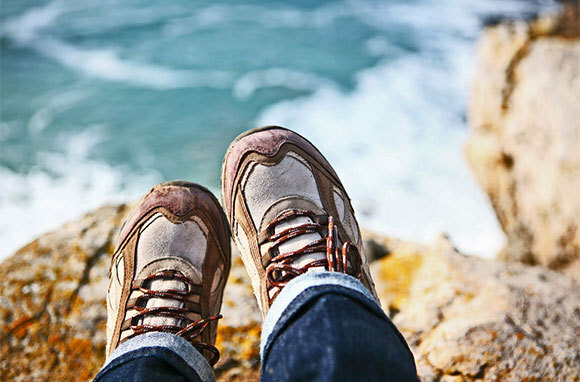 They may be high risk, but these treks give high rewards in the form of views and bragging rights. You'll have to wait a few years to tackle this walk—after two fatal accidents, El Caminito del Rey is officially closed to tourists. However, the area is now being restored and is set to reopen to the public in 2015. The cliff-side pathway was originally constructed in order to allow workers to cross between the hydroelectric power plants at Chorro and Gaitanejo Falls, but its dangerous beauty soon attracted hikers and adventure seekers. The 3.3-foot-wide walkway was built into the cliff face 330 feet above El Chorro river, and visitors had to navigate without handrails and over crumbled sections. Once the renovations are complete, walkers will have protective barriers, lighting, and rails to make the walkway safer. Newport's Cliff Walk website warns that "you pass at your own risk on the walk … In spots just a couple of feet from the path are abrupt drops of over 70 feet. Wild bushes and weeds often hide this danger." Sheer drops aren't the only dangers on this path. 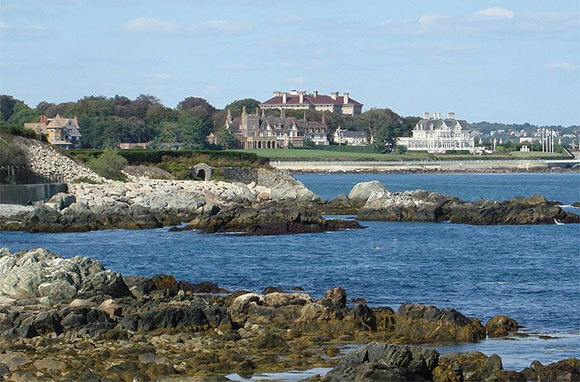 You also need to watch out for poison ivy, which can be easy to miss as your eyes will likely be glued to the Gilded Age mansions on one side of the trail and the beautiful but treacherous Atlantic coastline on the other. The only thing that makes this a cliff walk is that it's attached to the side of a cliff—but your feet never actually touch the cliff face. 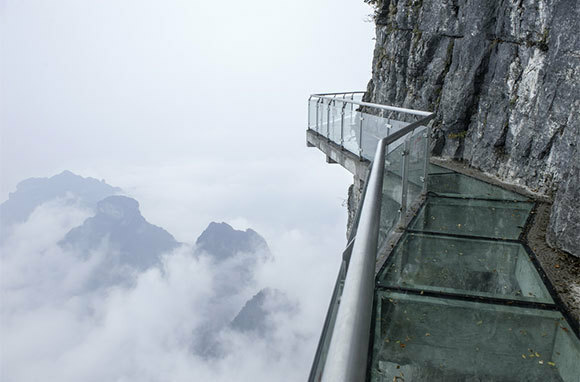 Instead, test your nerves by walking 4,000 feet above sea level with just a three-foot-wide, 2.5-inch-thick glass walkway separating you from certain death. 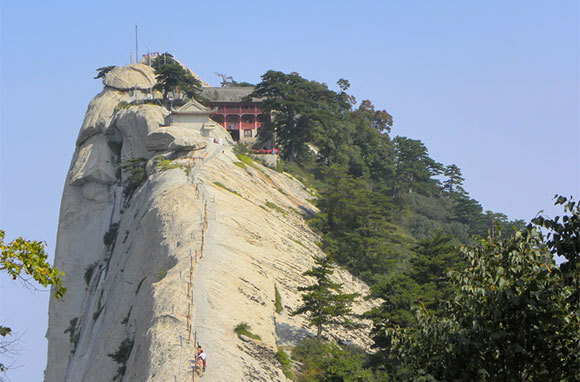 Try not to look down—not only will you be scared, but you'll miss the amazing panoramic Hunan Province views. 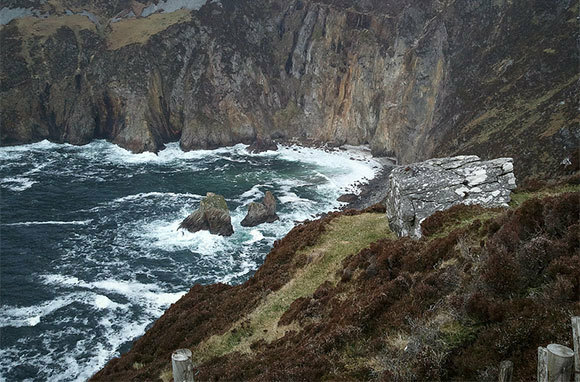 If you wish to summit the Slieve League Cliffs, you'll need to take One Man's Path—so named because it is only wide enough for one person to walk at a time. Slip off the narrow walkway and you'll tumble almost 2,000 feet into the ocean below. It's definitely not advised to try this one in misty weather (basically every day in Ireland) or on windy days. A special safety harness keeps tourists safe on this crazy cliff walk on wooden boards that were nailed into the cliff side more than 700 years ago. Better make sure you're really up for this pathway's challenge—there's no turning back once you start, as the boards are only wide enough for one person to pass at a time. There's no wimpy safety rails or barriers at Preikestolen—it's up to visitors to decide how close they want to get to the edge. 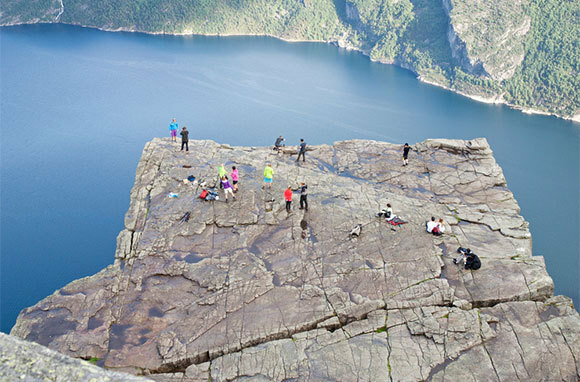 Also known as Pulpit Rock, this cliff is an 82 x 82-foot flat surface that hovers almost 2,000 feet over the Lysefjord. Although the cliff's top is flat, the hike up is steep and can take between one and three hours. 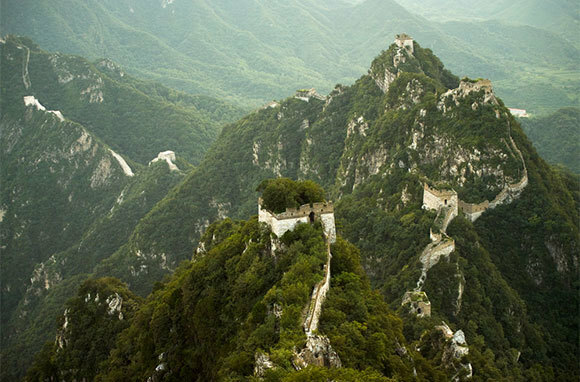 The Jiankou section of the Great Wall of China features steep drop-offs on each side. Add that to the pathway's poor condition, and it's easy to see why this is one of the Great Wall's most dangerous areas (but also one of its most picturesque). The white limestone cliffs surrounding the Faro de Los Morrillos, or the Cabo Rojo Lighthouse, are a beautiful and fairly easy walk. But be careful about getting too close to the edge—if the memorials to people who have died here aren't enough of a deterrent, heed our warning that these limestone cliffs are deceptive and what looks like solid ground can actually be just a few inches thick and very fragile. And watch out for open holes in the limestone that can send you plunging into the ocean below! 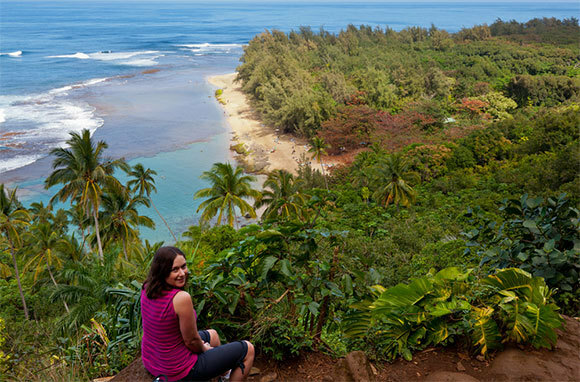 This trek has all the classic Hawaiian scenery: coastal views, waterfalls, and volcanic rocks. But the sheer 300-foot drop-offs can be intimidating for some, especially those who have read about the trail on Backpacker.com, which highlights the close calls that have occurred on the precarious path. One such incident occurred in 2006, when a man slipped on the trail and fell headfirst down a slope. He was only spared from going over the cliffs when his head smashed into a rock, which stopped his descent. According to the article, "The impact separated his nostrils from his face, but he survived." They should put that quote in the tourism brochures! There's nothing more than warning signs, a low stone barrier, and common sense to keep you from walking the hazardously narrow paths along the Cliffs of Moher. But every year, people get too close to the edges and are blown off to fall 700 feet into the ocean. If you choose to ignore the warnings, be very careful, as many parts of the path appear solid but are in fact unstable and slippery. And we don't recommend taking your bike out there—the ledge that those riders biked on has now collapsed, which just highlights how dangerous it is to venture outside of the designated paths on the Cliffs of Moher.